It was one of the worst days for weather conditions in a long time at the New Castle Motorsports Park. 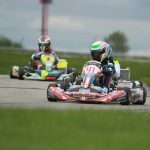 The first round of the 2016 United States Pro Kart Series was welcomed to harsh cold and windy weather, quite unseasonable for Indy in mid-May. Thankfully, there was no rain to bring in conditions much like those that plagued the inaugural USPKS event at GoPro Motorplex in 2013. The series opened at the Indiana facility for the first time in its four-year history, with eight categories of IAME and Yamaha divisions beginning the journey toward the championship crowning event in September. The opening day was a game of chess, with the best drivers taking on the Franklin Motorsport IAME Pro division, all vying for a chance of $1,000. 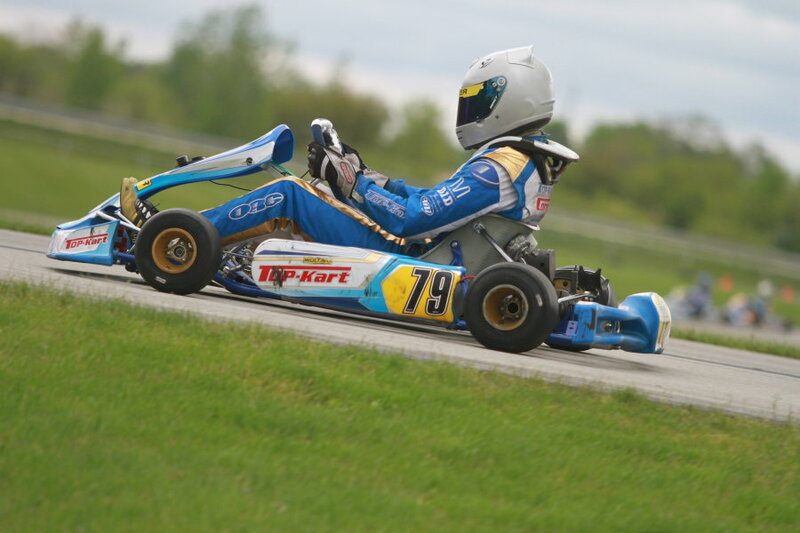 The first battle went to recent SKUSA winner Braden Eves (Kosmic), securing the fast time in qualifying. When racing began, Senior rookie Brandon Lemke (Merlin) emerged as the driver to beat, moving from outside the front row to P1 in both heat races. Lemke took full advantage of the pole position for the main event, pulling away early as the rest of the field fought for P2. Eves, starting third, eventually took the position and with the draft help of new COMPKART driver Austin Garrison, and the duo reeled in the rookie. Eves took over the lead on lap 13, and never looked back, securing his first USPKS Pro victory and the big winner’s check. The race went to the checkered flag with Lemke able to hold off a charging Brandon Jarsocrak, as the KartSport North America / Praga driver attacked from 14th to third as Garrison fell back to fourth. TJ Koyen (Exprit) put in a drive of his own, climbing up to fifth in the late stages of the race, but the DeepSeat Hard Charger award of $100 went to Senior rookie Zach Holden (Tony Kart), who advanced from 29th to 12th. Brandon Lemke made his USPKS Senior debut in the Comet Racing Engines Yamaha Pro division, ripping off two wins in the heat races. The double Junior champion in 2015 set the pace in the main event, trailed by top qualifier Jake McWhirter (Tony Kart), local star Jimmy Simpson (Tony Kart) and last year’s vice-champion Dakota Pesek (Top Kart). Lemke looked dominant in the heat races, but the trio of drivers closed up in the main event, staying in his draft. McWhirter eventually lost the aero pull, getting shuffled out to leave the remaining three drivers to battle for the win. Lots of jostling occurred for the top spot all the way to the checkered flag. The three went inside-out at the I-70 corner, and Pesek was able to get the best run and move inside of Lemke through the kink. At the line, Pesek secured the victory by just 27 thousandths of a second, while Simpson took to second over Lemke, who was just 43 thousandths back in third. Zach Holden (Tony Kart) made his Senior debut as well, climbing from 14th to fourth to work past McWhirter late in the race. It wasn’t until the main event that Alex Bertagnoli showed his hand in the Innovative Performance IAME Junior division, pulling out to a near three-second advantage in the 14-lap main event. Top qualifier Sam Mayer and Dylan Tavella split the heat race wins, with Bertagnoli sitting back in fourth during both races. 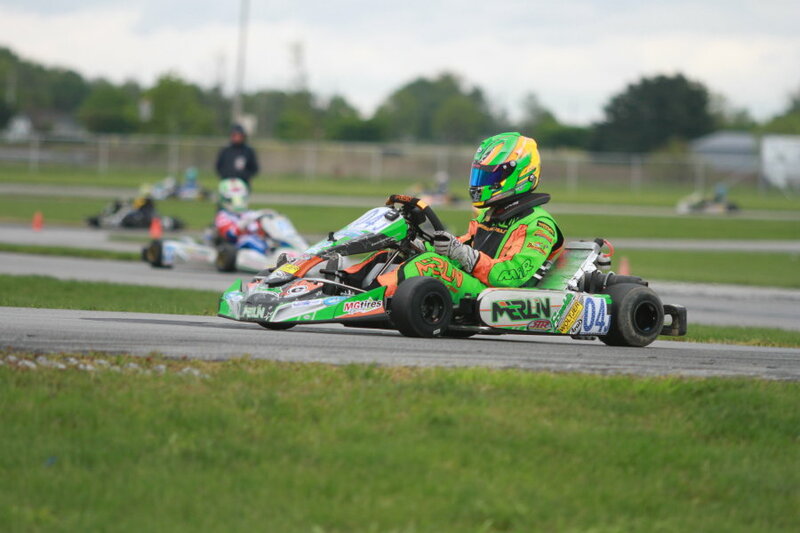 The Franklin Motorsport / Merlin driver put himself in the lead pack early, and then took over the lead on lap five before driving away to his first USPKS Junior victory. The battle on-track ended up being for second as Mayer (Merlin) took the spot just ahead of Fenderson (Tony Kart). Tavella ran alone in fourth while Ty Gibbs (Tony Kart) drove up from 17th to fifth, completing an impressive performance. The day in Woltjer Racing Engines Yamaha Junior belonged to Zack Pretorius (FA Kart). The local driver swept the events, leading from qualifying through to the final checkered flag. 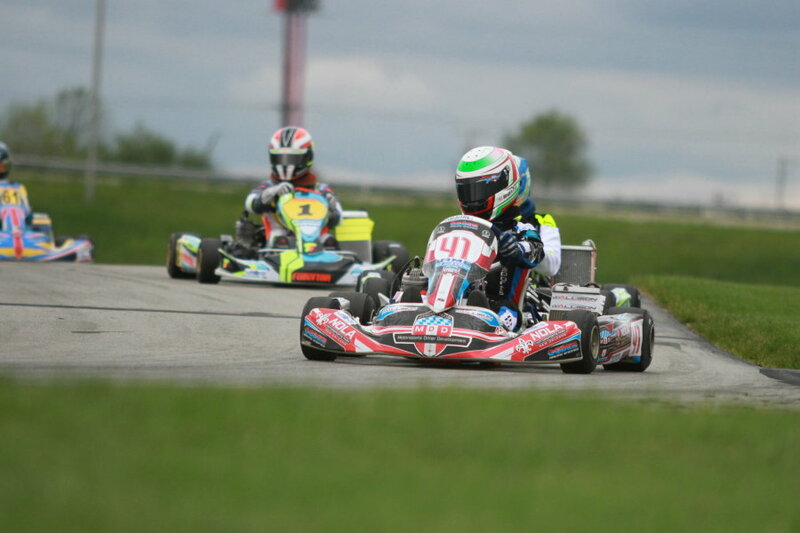 Pretorius broke away early in the main, and pulled out to a near five-second victory in his USPKS debut. Dylan Tavella (Tony Kart) won the heated battle for second over Sam Mayer (Merlin), Sam Paley (Tecno) and Alex Bertagnoli (Merlin). Saturday began with a bit of confusion in the Allison Racing Engines IAME Cadet class as the USPKS officials were conducting clutch tests on the pre-grid as the field let go before all competitors could be checked. As a result, officials elected to run another qualifying session at the end of the round for all drivers. 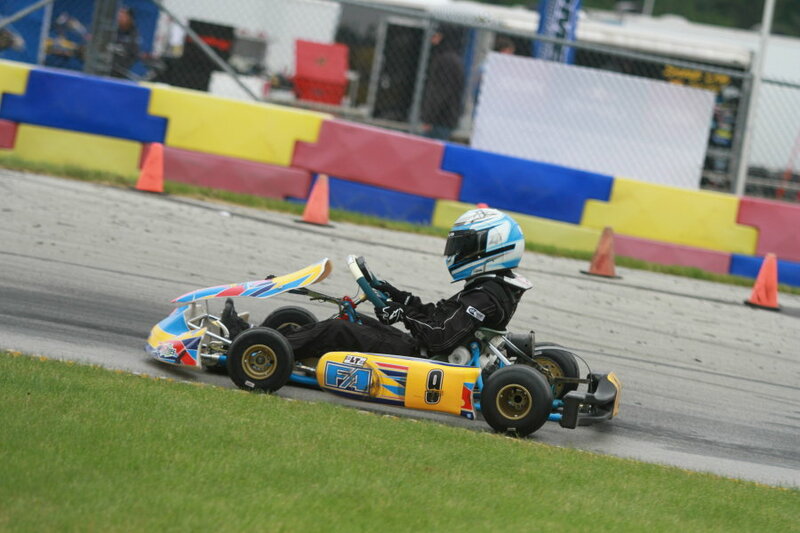 Each kart was tested prior to the field getting let go. Kyle Thome (Merlin) took the top spot, and went on to win both heat races. From there, Thome led all 14 laps of the main event to score his first series victory. Tyler Maxson (Benik) was a close second, just 31 thousandths back at the checkered flag. Colin Queen (Tony Kart) won the battle for third over Robert Noaker III (Merlin) while Rylee Engel (Tony Kart) turned in a stellar outing, coming from 20th to fifth. A duel decided the winner of the Switch Racing Engines Yamaha Cadet category. Top qualifier Garrett Adams (FA Kart) and Kaden Wharff (Top Kart) pulled away from the field in the main event. Adams, already a winnerin a heat race, set the pace early before Wharff took a turn out front. Adams took back the lead until the final lap, as Wharff drafted past him down the final straight to the checkered flag. The gap was just 22 thousandths at the line with Wharff winning over Adams. Heat race winner Kyle Thome (Merlin) was third ahead of Nicholas Terlecki (Ricciardo) and Colin Queen (Tony Kart). IAME Rookie, sponsored by Jay Howard’s Motorsports Driver Development, made its USPKS debut on Saturday with Brent Crews becoming the inaugural winner. Crews was the top qualifier, splitting the heat races with Adam Maxwell (FA Kart). The two pulled away from the rest of the field in the main event, taking turns at the lead. Crew emerged as the quickest driver, crossing the line first for the victory. Maxwell was a close second with Paige Crawford (Tony Kart) back in third. Mateo Rubio-Luengo (Kosmic) was fourth and Danny Dyszelski (OTK) was fifth. Paige Crawford finished her USPKS debut with a victory in the QPS Employment Group Yamaha Rookie division. Crawford emerged as a top contender after winning the two heat races following a P3 qualifying effort. An opening corner incident involving outside pole sitter Elliot Cox (Benik) dropped Crawford to third and allowed Danny Dyszelski (OTK) and Adam Maxwell (FA Kart) to set the pace in the main event. Crawford ran them both down, passed each, and pulled away to a 2.4-second victory. Dyselski won the battle for second over Maxwell, as Cox recovered to finish fourth ahead of Mateo Rubio-Luengo (Kosmic).